If you or your firm is experienced in marketing, communications and outreach with a special interest in environmental, conservation, recycling and behavior change, CARE has a great opportunity for you! We’re currently seeking proposals to provide Behavior Change Marketing, Education and Outreach (ME&O) professional communications services in support of the California Carpet Stewardship Program education and outreach strategy. For complete details, click here to download the official RFP. Proposals are due by August 15, 2014. Questions related to the opportunity may be submitted to Brennen Jensen, California Carpet Stewardship Program Manager for CARE, at bjensen@carpetrecovery.org. 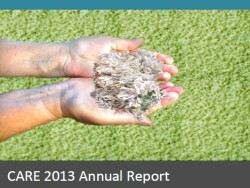 After collecting data on the various carpet diversion methods, reviewing our product and market development activities, and evaluating our industry programs, we’re proud to release the CARE Annual Report for 2013! As revealed in the 12th annual report, we’ve seen a more than 52% increase in U.S. gross post-consumer carpet collections from 2012 to 2013. CARE partners have diverted 534 million pounds of carpet, or 14 percent of the 3.7 billion pounds of total discarded carpet, from landfills last year. The environmental impact of the 2013 carpet diversion effort is calculated to be the equivalent of taking 40,822 cars off the road, or saving enough energy to power 17,692 homes for the year. 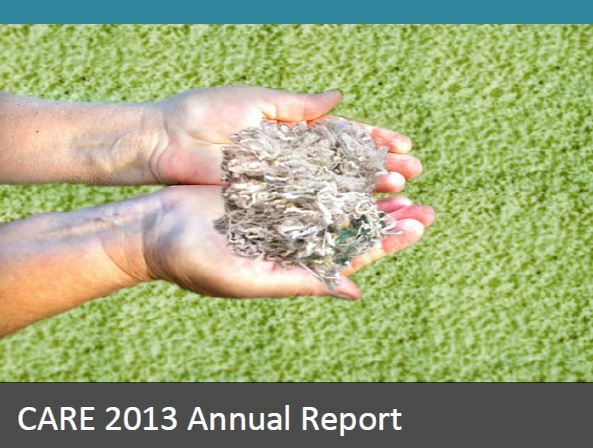 Since its founding in 2002, CARE members have diverted more than 3.25 billion gross pounds of post-consumer carpet from landfills in the U.S.
One of the most significant developments was an 87% increase in post-consumer carpet going back to carpet face fiber now at 28% of recycled pounds. In addition, post-consumer carpet going into carpet backing represented another 17%, a 25% increase over 2012 data. These are major accomplishments and come from significant investment in R&D and commercial implementation by CARE members. To view the complete CARE 2013 Annual Report, click here. In the process of choosing and installing a new floor covering in a facility, determining an environmentally responsible destination for the used carpet might not be a priority in the project. 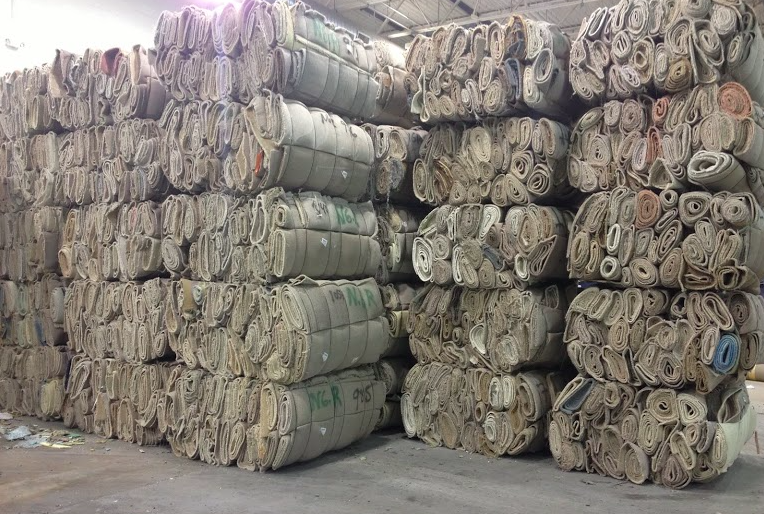 CARE’s Executive Director Bob Peoples recently addressed this topic and the growing number of options for recycling old carpet in the June issue of Today’s Facility Manager. Approximately four billion pounds of used carpet are deposited in landfills each year. This significant burden on the environment can be avoided by proactive approaches taken with each commercial carpet installation. Developing recycler relationships and evaluating options can be a long – but worthwhile – journey. CARE is working closely with mills and recyclers to help develop sustainable end of life options for PET, PTT, and PP fiber types. There are also new innovations on the horizon for manufacturing PET carpet that can be easily recycled into new products. Click here to read the full article, and share your thoughts with us in the comments below. CARE is seeking proposals for a 12-18 month project to demonstrate value-added uses for polyethylene terephthalate (PET) derived from post-consumer PET carpets (PCC). The goals of this project are to develop processes, products and identify viable market outlets for this feedstock. The scope of the project will cover fundamental materials science and specifications of PCC derived PET as a key feedstock, viable processes for conversion into a product(s), identification of market outlets and a business plan based on an economic model to translate the product(s) to the marketplace. Prototype products are required to demonstrate proof of principle and market contacts are encouraged. It is expected that a cross-disciplinary team based approach will be part of the proposal. Over the past decade, post consumer carpet (PCC) recycling has grown and developed its own market driven industry. With CARE’s help, this industry has become very sophisticated and has developed intricate processes to recycle PCC. There are 4 basic polymer types used to manufacture carpet (both broadloom and tile): nylon 6, nylon 66, polyester (PET) and polypropylene (PP). The national recycling infrastructure has become increasingly successful solely based on the value of nylon face fibers. The entire U.S. PCC recycling industry, manufacturers and entrepreneurs alike, have developed technically and financially viable businesses based on the high value of nylon engineered resins and fibers. Nylon has always had a large and diverse base of end uses and applications from engineered plastics to fiber applications. The only barrier in broadening the deployment of high value nylon made from PCC has been the development of technology to efficiently separate nylon from the other carpet constituents and purify the resultant nylon to levels nearly equivalent to those of postindustrial scrap. Over the past 10 years, these methods have been commercialized and the result has been a robust growth in the acceptance and use of post-consumer nylon from carpet in a large variety of end uses. Polypropylene (PP) face fiber carpets and which also contain PP backing are also being successfully recycled. Since the value of PP is much less valuable than that of nylon, it cannot form the sole basis of a successful recycling business. It becomes accretive to the viability of any post- consumer Nylon carpet recycling system. The other major face fiber is polyester (PET). Presently there are very few outlets for this recycled polymer. While PET resin, both virgin and recycled PET derived from bottles, is ubiquitous, the technology has not proven economically feasible for PCC derived feedstocks. CARE will make information and access to existing products and processes available to aid research, including processing plant visits if deemed necessary. Since the entire recycling infrastructure for recycling PCC was and is based on nylon, and to a lesser extent, polypropylene, other PCC materials, such as PET carpet in particular, have become a major negative cost factor to collectors/processors. The reason is simple: There is no readily established high value market for rPET in the normal “plastics world”, as was the case for nylon. Therefore, end uses for PET must be developed in other areas. From a technical standpoint, PET has no “stand alone” engineered resins specifications or high volume applications due to the brittleness of PET polymer. There are a large number of other potential applications and it must be proven that PCC derived PET can be made to fit those applications. Why has PET become such a problem so quickly? Just 7 years ago , CARE data shows that approximately 4% of the PCC stream collected was PET. In 2013, the percentage of PET in the collection stream is now estimated to be 34% and growing. If no solution is found, close to half of all collected PCC will find its way back into landfills at unsustainable costs to recyclers. Track 1: Create a viable polymer stream that is usable for carpet or other plastic markets. What would it take for the carpet industry to consider blending PCC PET back into flake for extrusion into PET carpet fiber? The purpose of this track is to explore methods of cleaning and/or depolymerization of fiber that has been harvested from used carpets. The grant will fund research for new methods/processes that result in resin that meets identified market demands for cost and quality. Track 2: Find new end use(s) for rPET that has either been cleaned and/or depolymerized. What can a source of rPET be used for in its next life. This grant track will explore new applications for the use of rPET derived from post-consumer carpet. The project will focus on product uses and identify new markets for rPET (e.g., rPET as a feedstock for 3-D printing or rPET for use in the apparel or building industry products). This high impact proposal is targeted for duration of 1 to 1.5 years. The proposed start date is academic year 2015 and with an end date of 1-1.5 years. However, other time cycles will be given consideration with justification. During this time frame, a clear and economically viable path toward PET carpet recycling must be developed. While the infrastructure for the path forward cannot be built out totally in one year, demonstration of a variety of technologies, applicable products, market outlets, performance specifications and an economic model(s) will be complete. • The PET project is a commitment to be funded at $500,000. • Candidate will be required to sign a) a conflict of interest agreement, b) a Non-Disclosure Agreement, and offer CARE members a royalty free non-exclusive agreement. • University overhead must not exceed 25%. • Proposal may be for contract research if needed. • The proposal is open to any U.S. based academic institution with a research program. • Acknowledge any conflicts or prior employment with carpet industry and/or recycling industry entities. A CARE selection Committee will review proposals and make a final decision by mid-December 2014. Projects work must commence in 2016. We’re pleased to share an exciting update from Shaw, a leading carpet manufacturer and CARE partner! Along with Georgia Governor Nathan Deal, Shaw announced last week its plans to expand its carpet recycling portfolio to include a new facility in Ringgold, Georgia – to be known as Evergreen Ringgold. The facility will recycle nylon and polyester carpet into high-purity post-consumer recycled material that can be used in a broad range of applications. This more than $17 million investment will convert what was previously a rug distribution center into a post-consumer carpet recycling facility. Evergreen Ringgold is scheduled to open in 2015 and will create 70 new jobs. Complementing Shaw’s existing portfolio of recycling solutions – including elutriation, waste-to-energy, Re2E and Evergreen Augusta operations – Evergreen Ringgold supports Shaw’s Cradle to Cradle commitment and efforts to keep end-of-use carpet out of the landfill. To learn more about this exciting development for Shaw and the carpet recycling industry, read the complete announcement featured in Recycling Today.